Pierrot and Mimile travel to a small village in the south of France to attend the funeral of Lucette, the wife of their friend Antoine. 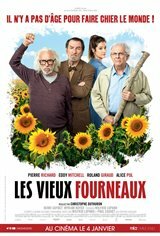 Tinged with nostalgia, the reunion of these three leftist septuagenarians goes pretty well until Antoine gets his hands on a letter proving that the deceased had an affair 50 years earlier with the boss of a major local company. Antoine takes a shotgun and leaves in the middle of the night for Tuscany, where Lucette’s former lover enjoys peaceful days at his luxurious villa. To prevent Antoine from committing murder, Pierrot, Mimile and Sophie, Antoine’s pregnant granddaughter, go after him in hot pursuit.